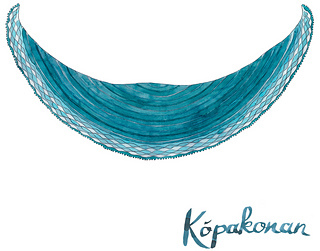 The Kópakonan shawl is part of the beautiful and unique knitting book named Sjaler Nordfra in Danish and Nordic Shawls in English. The book has 18 gorgeous shawls designed by Karen S. Lauger, inspired by the wild Nordic nature and the stories of the creatures that live there. Kópakonan is the Faroese selkie, who on the thirteenth night - the magical night - sheds her pelt and walks the shores as a woman. She is beautiful and alluring, but also dangerous if crossed. Kópakonan er Færøernes sælkone, der på den trettende nat - den magiske nat efter Helligtrekongers dag - lægger sin ham og kommer på land som kvinde. Hun er smuk og tillokkende, men også farlig at komme på tværs af.